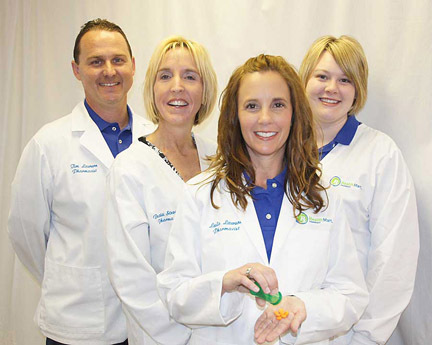 Your August Bee Healthy Tip from the trusted team at Metropolis Drugs II: from left: Tim Lawson, Dacia Stewart, Leslie Lawson and Lauren Scott. Come by and we can talk over your health and safety plans for the school year. WebMD: Back-to-School Health Checklist. Available at: http://www.webmd.com/parenting/features/back-to-school-health-checklist Accessed 7/3/16. EmergencyCareForYou: Homework for Parents—Your Child’s Back-To-School Health Checklist. Available at: http://www.emergencycareforyou.org/Health-Tips/Child-Emergencies/Homework-for-Parents-%E2%80%94-Your-Child-s-Back-To-School-Health-Checklist/ Accessed 7/3/16. National Association Of School Nurses: Back to School Family Checklist. Available at: https://www.nasn.org/portals/0/resources/BacktoSchoolChecklistFamily_2015.pdf Accessed 7/3/16. CDC: Back to School Health & Safety Checklist. Available at: https://www.cdc.gov/media/dpk/2013/docs/back-to-school/Back-to-School-Checklist.pdf Accessed 7/3/16. This entry was posted in All the Buzz - Bee Informed, Bee Healthy on July 23, 2016 by massacbeeswax.